Wash and clean fish pieces. Make sure to drain out water completely. Blend red chilli powder, black pepper corns, turmeric powder, shallots, garlic cloves and salt and make a thick paste without adding water. Create fine cuts on both sides of the fish to get the masala in. Marinate fish with this thick paste and refrigerate for 1-2 hours. In deep saucepan /tawa heat 3-4 tbsp refined oil. 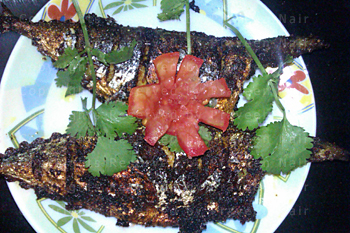 Arrange fish pieces and shallow fry till golden brown and crisp on both the sides on medium heat. Drain on paper towels to absorb extra oil.